Korean cinema major CJ CGV will become the first major foreign exhibitor to expand into Russia, with plans to build 33 cinemas with 160 screens in Moscow by 2020. CJ CGV signed a deal with Russian real estate company ADG Group to form a 70-30 joint venture called RusCo out of Hong Kong with a registered capital amounting to US$30 million. CGV has been growing aggressively abroad in the past few years, with acquisitions and organic growth in China, Vietnam, Indonesia, Myanmar as well as buying Turkey’s Mars cinema for USD $800 million last year and announcing its first multiplex project in New York City earlier this month. The company has a stated ambition of becoming the world’s largest cinema chain with 10,000 screens by 2020, though its plans for “aggressive acquisition” was overshadowed by the even more aggressive buying spree of Wanda/Odeon over the past 18 months. This past August CGV was said to be in negotiations to buy Karo Cinemas, Russia’s fourth largest cinema chain with 219 screens, though parallel negotiations were also going on with ADG Group at the time. Multiple trips to Moscow and as many as 30 negotiators from the Korean side ended with the exhibitor opting for ADG. In 2014 ADG Group acquired 39 outdated cinemas in the Moscow metropolitan area from the city government with a view of converting them to Neighbourhood Centres, described as “a new commercial real estate asset class.” The new cinema venture will be the anchor tenant in this locations, which will be a mix of retail, food, entertainment and lifestyle. The centres will have a catchment reach of 2.5 million Muscovites within 15 minutes walk of one of the centres. Neighbourhood centres offer their visitors everything for a quality time spending and proximity shopping, providing all the essentials in convenient and comfortable environment with a superior customer experience and respect to the interests of local communities. 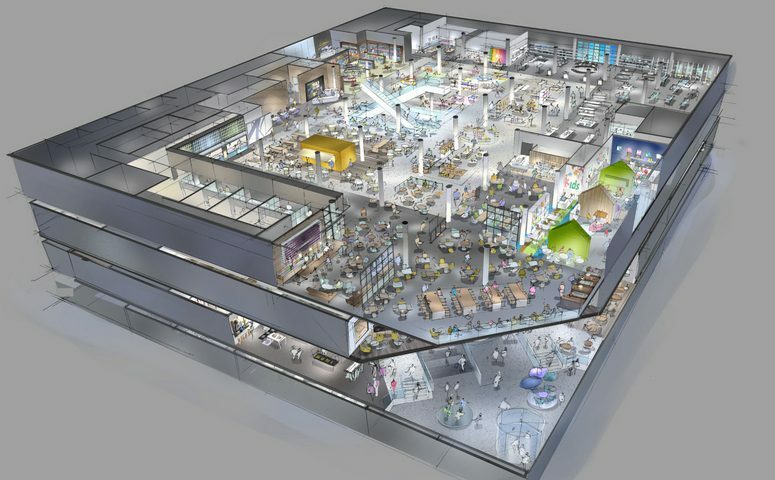 The potential of these physical locations is enlarged by the project’s online infrastructure in order to deliver both omnichannel sales and communications. The Neighbourhood Centres would act as a catalyst for revitalizing historical urban centres and improve the quality of urban retail and life. With 160 screens over 30 centres it will yield an average of less than five screen (4.85) per location, these will not be traditional ‘big box’ multiplexes. The majority of the properties are due to be completed in late 2018-early 2019 and together represent the biggest urban renewal project underway in Moscow, with a total of 480,000 sqm. By having a local partner and keeping a tight geographical initial focus on Moscow, CJ CGV may hope to avoid the kind of corruption-related problems faced by multinationals expanding in Russia. IKEA faces hundreds of lawsuits each year in Russia, which the Swedish furniture major says is retaliation for trying to conduct clean business and fighting corruption. CGV has said that it will explore expanding into other Russian cities, once the Moscow venture is ‘stable’. Russia is the world’s 14th largest cinema market, with 1.9% of global box office. However, Russia is also the second largest market in Europe with almost 195 million admissions in 2016, with a growth of 11.6% in tickets sold and 7.6% in box office. Having already overtaken UK and Germany, it is within sight of equalling or overtaking France, which had 213 million admissions in 2016 according to data from UNIC (PDF link). By 2021 box office is expected to have grown 25% compared to 2016, with a current average of just 1.37 cinema visits per person per year. “This is an important step in expanding the territory of CJ CGV as Russia is a major base to enter Europe in the long term,” said CEO Seo Jung, speaking at the CJ CGV-ADG signing ceremony in Seoul. “We’ll make efforts to spread Korea’s advanced multiplex theaters and increase the world’s awareness of the superiority of Korean movies and culture.” Though Korean films have found success abroad, the Moscow multiplexes will primarily show Hollywood and Russian blockbusters. Renovations of the old cinemas was due to have started in mid-2016 under terms of the deal betwene ADG and the Moscow city government. ADG paid RUB 9.58 billion (USD $152 million) and committed to investing around RUB 40 billion (USD $637 million) in the cinemas, many of which were dilapidated and had seen few improvements since communist days. Under the terms of the deal, the cinemas could not be turned into pure retail malls, but had to have cinema exhibition at its centre. Moscow represents 26% of all cinema screens in Russia. CJ CGV has 417 cinemas with 3,213 screens in Korea and globally. 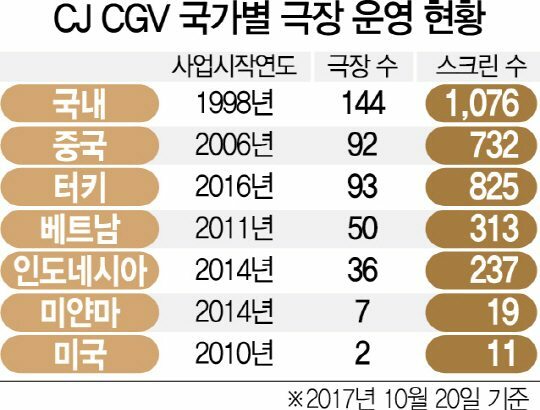 Slower box office growth in Korea means that CJ CGV is increasingly focusing on overseas markets.